WordPress Development for Noobs is a new blog series where I will explore creating a WordPress website from the ground up, with an eye on people who have little to no WordPress development experience. As a web developer in Minneapolis, I get a lot of questions about this and also appreciate sharing what I’ve learned, particularly because many people might not know, there is quite a bit you can do on your own if you’re willing to invest a bit of time. How to install WordPress on common hosting accounts such as GoDaddy, HostGator or BlueHost. If you are getting into WordPress and possibly even web development for the first time, you may be a little bit intimidated by installing WordPress from scratch. But it is so simple. And with WordPress, web development can be almost as simple as you want it to be, but the first step has a couple moving parts to it. This is true particularly if you want to do it from scratch on your webhost and not use a one-click WordPress install solution. Once you follow the steps here, you are one big step toward becoming something very useful indeed; a WordPress Wizard. It’s as simple as it sounds! Just head on over to WordPress.org and download the most recent version of WordPress. WordPress.org is centered around the open source version of this powerful content management system, whereas WordPress.com is about using it more as a blogging tool and because they host it, there are very big limitations to that route. When you download the most recent version from WordPress.org, feel free to unarchive the file as it will download as a zip file. Of course you’ll need to HAVE a hosting account in the first place, so head on over to GoDaddy, BlueHost, HostGator, or A Small Orange to get your hosting account first if you haven’t. I am satisfied with the hosting I have with GoDaddy, but there are many strong opinions on the matter, so feel free to read up. Make sure to choose hosting that gives you the appropriate amount of databases for your needs. Each new website you create using WordPress or any ‘content management system will require another database. Here is an image showing where you might find your databases in your hosting account. A. Any hosting account using CPanel. B. GoDaddy Hosting. Fill out the fields and remember (or jot down) your information– you’ll need it for the next step. Fill out the fields for your database, and jot down the information. Create a new username and password and jot them down, as you will need this information in the next step. For CPanel: On the next page, you can manage the privileges for the user. You need to ensure you give your user “All Privileges” as it allows WordPress to modify the database, create new tables, execute and more. If you don’t have one yet, there are some great free FTP file managers such as FileZilla. Simply install the FTP manager, and connect to the your hosting via an FTP user you can create in your hosting account. The video below shows the process of creating an FTP user that you can use to access the files in your hosting account via FileZilla or a similar FTP file manager. Press “File > Site Manager” and enter your info as shown in the image below. Enter your host (the host you’ve set up your FTP username under,) choose “Use Plain FTP” next to “Encryption” and then Login Type of “Normal.” Enter your FTP user and password. If you want to install WordPress on the root of the domain, highlight all the files within the WordPress file you downloaded from WordPress.org, and drag them into the root file that you have open in your FTP manager. The root of the domain means as the main site for your account – for instance, the root of my domain is timbdesign.com, a subdirectory is timbdesign.com/test. If you want to upload it in a subdirectory, simply name the WordPress file whatever you’d like the subdirectory to be and upload the full thing via the FTP manager. I will often hook the domain name up to it, and because I have a larger hosting account I can keep adding dot com’s in the hosting account, and they each have their own WordPress install. So in that case, rename the WordPress file, like the one circled in this screenshot, to the subfolder name of your choice, then drag it into the FTP manager. 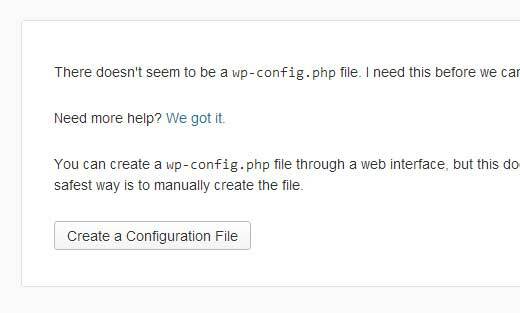 Navigate to the home domain if you uploaded the guts of the WordPress file to your root, or navigate to the subfolder if you renamed the WordPress file and uploaded it. On the next screen you can enter the information you wrote down earlier (database name, database username and password, database host, and table prefix). Simply click on the “Let’s go” button. Next you will see the form to enter all the information. After you type in the information, click “Submit.” It will take you to the page that has the button to “Run the Install.” Click on it. On the following screen, you will see the form to enter your website’s information. This information would be your site’s title and your username, password and email. Click Install WordPress, and you have entered a new realm of knowing how to install WordPress, which is a pretty cool place to be. 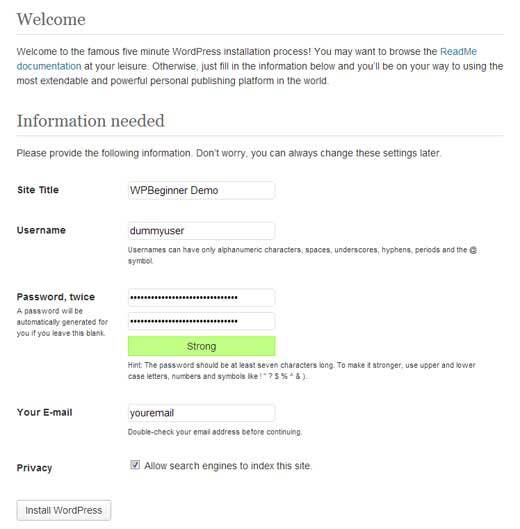 Options for installing WordPress with a one-step install, such as WPEngine or GoDaddy’s dedicated WordPress hosting, and reviews of each. For GoDaddy Managed WordPress Hosting, you simply choose a WordPress hosting plan and it’s already been installed for you. All you have to do is set up your website. First, login to your GoDaddy account. You will see a Web Hosting toggle in your Products tab. Open it up and click the “Launch” button for your new hosting plan. Next you’ll need to create your website, or migrate a site you’ve already created. For this walk-through, we chose to set up a new site to show you all of the options GoDaddy has to offer. As soon as you click that button, GoDaddy gets to work creating your website, and in just a few minutes or less you’ll see your brand new dashboard. From here you have two options: Either click on the big green “Get Started” button for GoDaddy Quick Setup, or upload and install your own theme and plugins. If you have a pro account with WPEngine, you will be able to add multiple WordPress installs to your account. You can’t delete the initial install that was created when you first set up your account with WPEngine. For them, your account is set up under URL account_name.wpengine.com and cannot be deleted. You can add and delete installs within their User Portal. You will receive an email shortly, notifying you that your install has been created. I can speak to GoDaddy’s dedicated hosting, and WPEngine’s, from first-hand experience as well as thoughts from around the web about people’s experience using BlueHost’s one-click install hosting. GoDaddy seems to have taken a clue from WPEngine’s very dedicated WordPress hosting and given people more of a WordPress-specific hosting backend. wWhen you are signed into their dedicated WordPress hosting, everything is very visual and cleaned up from past years before dedicated hosting. This has always been the case for WPEngine as they are bit fresher on the scene in general. Both of these services are very fast and extremely easy to set up. You can also tell that this is a lucrative business, because both WPEngine and GoDaddy customer service are very much on their game as of late. This is no Comcast. These people do make it seem like they care. From what I can tell, WPEngine is the more premier version with its backup system, but GoDaddy is a great solution as well. I am apt to include some thoughts on BlueHost here as well, because they have been endorsed by WordPress, though it seems some think that this endorsement may be highly biased because of sponsorship. However, after watching a YouTube video on BlueHost’s WordPress one-step install, it looks as though configuration is very simple indeed. Just consider that many people have cited down-time and speed issues, but there doesn’t seem to be a shortage of at least some people with these types of issues with many hosting solutions out there. There are many one-click install solutions out there, and although security may have been a concern at one point for these solutions, they are becoming more so. Just make sure to change passwords during the process away from default passwords, and make them long and hard to break. How to install WordPress without hosting on your computer locally, for development purposes. I may be in the minority of web developers, but I don’t mind developing on a hosting account directly, but a lot of developers swear by developing on WAMP, MAMP, Desktop Server or LAMP. 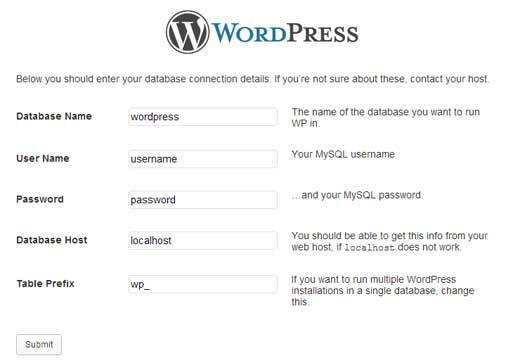 These all allow you to develop your websites that require a database (WordPress or any website with a content management system) on your computer without it being live on the web. This video quickly shows how to easily use MAMP (Mac) but its principles apply directly to WAMP (Windows) and LAMP (Linux) as well. There are many more chapters to WordPress Development for Noobs! Please keep following along on social media as I publish more. I am looking to serve people who need beginner WordPress tutorials, such as this one on how to install WordPress for the first time, as I’ve noticed I’m often around people who would appreciate this series. Please let me know what you’d like to see, how I could improve it, or how I can help you. Thanks for reading! If you found this useful, please tweet this so others can check it out, too. I don’t provide excellent web design in Minneapolis or provide these resources because it’s good for my health, I do it because I know it’s something people need. If I can help you with WordPress design and development, let me know. That is my specialty. 8 Comments on "Install WordPress for the First Time"